As astronomers have long expected, exploding stars called supernovascan accelerate particles up to almost the speed of light, a new study shows. The discovery helps explain where the extremely energeticcosmic rays we find near Earth come from. Cosmic rays are charged particles, mostly protons, that comeswooping through space from beyond the solar system. They carry such anenergetic punch they can knock out electronics systems on Earth if theymanage to make it past our atmosphere. Until now, scientists couldn't be sure how cosmic raysacquire their energy and speed. "It has longbeen thought that the super-accelerators that produce these cosmic rays inthe Milky Way are the expanding envelopes created by exploded stars, but ourobservations reveal the smoking gun that proves it," said Eveline Helder ofthe Astronomical Institute Utrecht of Utrecht University in the Netherlands, leaderof the new study. 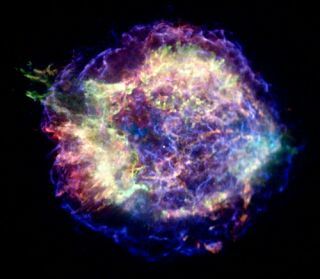 When a star diesin a supernova, the blast releases a huge amount of energy. Much of thatenergy is used to heat up a bubble of gas that expands around the remnant ofthe star. Some energy, though, goes toward speeding up the particles thatbecome cosmic rays, the researchers determined. "When a starexplodes in what we call a supernova a large part of the explosion energyis used for accelerating some particles up to extremely high energies,"Helder said. "The energy that is used for particle acceleration is at theexpense of heating the gas, which is therefore much colder than theory predicts." Helder and team looked at the leftovers from a supernovacalled RCW 86 with the European Southern Observatory?s Very Large Telescope.The star exploded about 8200 light-years away in AD 185, and was recorded byChinese astronomers. The modern researchers measured the temperature and speed ofthe gas behind the shock wave created by the stellar explosion. They found thatthe gas, at 54 million degrees Fahrenheit (30 million degrees Celsius), wasmuch lower than would be expected given the shock wave?s velocity. Rather than heat up the gas, some of the supernova's energywent toward speeding up particles to near the velocity of light, the astronomersconcluded.
? "The missing energy is what drives the cosmic rays,"said collaborator Jacco Vink, also from the Astronomical Institute Utrecht. Helder and team describe their findings in the June 26 issueof the journal Science.